Above: Tortillas from Duran&apos;s Central Pharmacy. Photograph by Inga Hendrickson. WHEN YOU LOVE FOOD, it’s tempting to get distracted by shiny things: the hottest restaurants, the boldest chefs, the trendiest ingredients. But these are often transitory pleasures, stars that burn brightly but fizzle with the turn of the season—gone the way of fennel pollen and Emeril Lagasse. 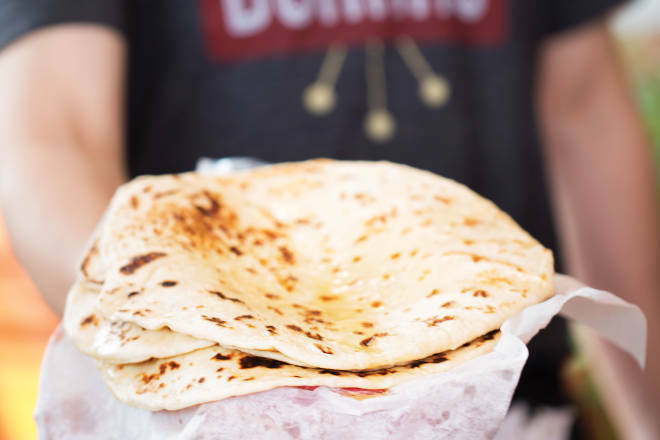 The humble tortilla, invented around 10,000 BC, is the opposite of that. It’s an enduring staple cemented in our culinary canon. A fresh handmade tortilla that’s pillowy enough to rest your cheek on lures us over and over with its sybaritic simplicity. But while many of our readers inherited the family recipe, others confess that they never learned how to mix lard into flour or heat the griddle to just the right temperature. These days, most New Mexicans get that taste of home at restaurants like Duran Central Pharmacy, near Albuquerque’s Old Town, a 76-year-old institution where every tortilla is still rolled, turned, and cooked by hand. Recently, we pulled up our stools and sat raptly as one of Duran’s tortilla masters, Cecilia Granados, gave us the lesson we never had. We took notes and photos. On the following pages, you’ll find a step-by-step tutorial. Take Granados’ tips, master your own tortilla technique, then pass it on to the hungry little ones in your kitchen and we’ll all have a panza llena and a corazon contento forever. Over the course of its 95 years, New Mexico Magazine has published a baker’s dozen of tortilla recipes, each one slightly different. Duran’s cooks didn’t want to reveal their exact formula. But, while photographing one of them (right), we could tell their recipe shares the same ingredients as all of ours: flour, lard (or shortening, if you must), salt, baking powder, and water. The real secret is in the technique. In a large mixing bowl, stir together the flour, baking powder, and salt, then add the lard or shortening. Work the fat into the flour with your hands until it resembles coarse bread crumbs. Mix with your hands until it comes together into a sticky dough. Gather the dough and turn it out onto a floured surface (the bowl works fine for the pros), kneading for about a minute until it becomes smooth and satiny. Let it rest at least 15 minutes. Pinch off an egg-size ball. Duran’s tortillas are very big and very puffy, so Cecilia Granados&apos; ball is the size of a turkey egg. Shape the dough into a fat disk. Repeat with the remaining dough. On a floured surface, give each disk a few quick passes with a roller, pressing from the center toward the edges. Give the dough a quarter turn and repeat until the circle is between 1/8- and -inch thick and 10–12 inches in diameter. Heat a large cast-iron griddle or pan over high heat, to about 500°. Add one circle of dough and cook 30–45 seconds, until large bubbles form across the surface. Check if brown spots have appeared on the bottom. If so, flip the tortilla and cook another 30–45 seconds, until it puffs and browns on the other side. Rest the tortillas under a towel while you cook the others. WHO MAKES THE BEST TORTILLAS? Share your favorites with us on Instagram at @NewMexicoMag, or on our Facebook page.